‘BUZZING’ ABOUT BOOKS IN LEIGHTON BUZZARD! This post was written by peterjmurray on June 8th, 2018 1:40 pm Comments Off on ‘BUZZING’ ABOUT BOOKS IN LEIGHTON BUZZARD! Kath and I were fortunate enough to be invited to Linsdale Middle School in Leighton Buzzard. The school is big and has over 600 pupils in Years 5 to 8. Hence, we decided to work over two days, the first day with Years 7 and 8 and the second day with Years 5 and 6. Some authors would say that to enthuse the older pupils in the summer term would be a challenge…especially the Years 8’s in their final year of middle school. But, as already ‘tweeted’ in my latest ‘tweet’…NO WAY! Both audiences proved exceptionally easy to perform to…fully attentive, interactive and hanging on every spooky word! The Year 7’s and 8’s were entertained with my dramatic Bonebreaker presentation and some of the pupils provided excellent acting skills as they joined me on stage. Will we ever forget the six-feet tall Dunston, doing his best to help out his much-shorter Saxon hero-friend, Wilfrid! Comedy entertainment at its best to say the least! 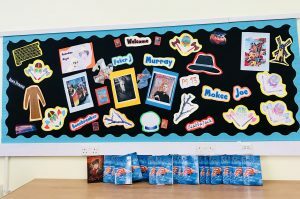 The Year 5’s and 6’s were just as entertaining and seemed fully-engaged in the full-blown Mokee Joe presentation…climaxing with the final MJ book set in Dubai. Both audiences provided a select group of pupils for our afternoon workshop based on our Ten O’ Clock Caller short story collection, and again, brilliant fun with brilliantly-attentive pupils! Kath can’t bear to look! signing-for-all during our final day. Over my entire author career of around 15 years, I can’t remember signing so many books in one morning (around 3 hours). I think it’s safe to say that records were broken…as seemed my signing hand at the end (repetitive strain injury!). Again, during the signing, our entire crowd of enthusiasts were polite, well-mannered and more than friendly in their conversation and relentless questioning. WOW! Thank you Linslade for being so amazing and renewing my confidence to go on and write more scary books and to make more school visits. You reminded Kath and I why we love our job so much and why we feel so privileged to visit schools like yours. 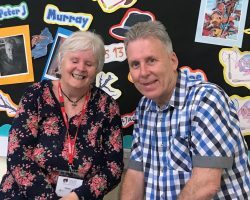 A BIG ‘thank you to Mrs Lewin, Kelly the lovely librarian, and all of the staff for making us so welcome…and that includes Matt the IT expert, the reception staff and the caretakers.